NASA’s Hubble has captured a stellar explosion 20,000 light years away. 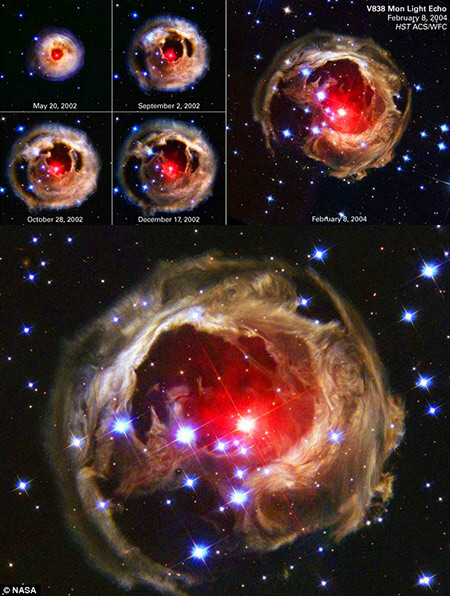 The incredible time-lapse animation you’re about to see spans four years and documents a massive explosion from V838 Monocerotis, a red star located in the constellation Monoceros. Right up to the explosion, V838 had grown to become one of the largest stars ever observed by astronomers, producing 600,000 times more light than our own sun. Continue reading for the clip and more information.